This go-around, I really wanted to pick something I cherished as a kid, but probably never finished. 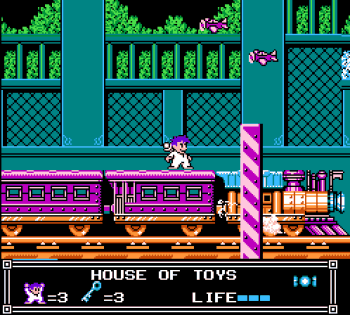 For that, I had to go with Little Nemo: The Dream Master. I have a few memories of this game that really stand out: renting it from a Shaw’s grocery store based on all the crazy colorful hijinks depicted on the cover, and eventually receiving my own copy for my birthday… Probably my 6th or 7th. I literally ran around in circles in excitement. I remember this. (Also; why do all of us Nintendo nerds have such vivid memories of these moments?) I have a basic recollection of the first few levels and I know there was a stage with a train that I always got stuck on. I remember the final boss, which leads me to believe this is one of those games that I used Game Genie just so I could play the whole adventure. Well, not anymore. Time to pop this sucker in and beat it for real, two decades later. As I jump in, it’s all coming back to me… you play as a sleeping little boy and each level is based on a new dream he is experiencing. It’s a Capcom title, and that becomes pretty obvious to any NES aficionado pretty quickly: bitchingly awesome soundtrack, constantly re-spawning enemies, unforgiving gameplay and bright and dynamic visuals. Each stage has a certain amount of keys you need to collect in order to pass to the next level and it’s never clear how many you need until you reach the end, where you find a door with a certain amount of locks. There’s no worse feeling than reaching that door with five keys, only to see six locks. Your only weapon, initially at least, is candy that you throw in a small arc. A scepter is seen strapped to Nemo’s back like a sword, but you are unable to access it. Along the way, you’ll find certain animals that will help you… after you force feed them candy and they pass the hell out. (Naturally.) You are then either able to ride on the animal, or… somehow… enter their skin and become them. Nemo, there’s a lot to unpack from your dreams. You might be a furry? You might be a furry. Soon into the first level, I needed to remind myself I had returned to a different era of gaming and I would need to abandon a lot of principles and guidelines I had followed for the last 20 years or so. Oh, water… Haven’t seen that in the game yet. Will it kill me? Should I jump in? There’s no visible bottom, while I sink and die? Nope. Jump in, and actually swim to the bottom, OFF SCREEN, which in 95% of other games would be certain death. Down there you’ll find extra lives and health, or even better, something imperative to beating the stage. The story is delivered to you in-between stages through dialogue of what appears to be Nemo’s parents off screen telling him to either “GO BACK TO BED” or “GET UP” (which is very inconsistent and confusing as the whole game takes place with Nemo asleep) or strange creatures at the beginning of a stage telling you redundant or irrelevant tidbits. Sometimes both – on the stage based on Nemo’s house, bearing the creative moniker “Nemo’s House”, the creature really sticks the landing of this point by shouting “NEMO, I THINK WE’RE IN YOUR HOUSE”. The dreaded train stage referenced above was ONLY LEVEL 3. I clearly struggled with this game as a child, to undergo such difficulty so early on in the game. This stage has it all: a side scrolling element you need to keep up with, kamikaze planes, spikes that cause instant death (just like his Capcom-cousin Mega Man, Nemo don’t do spikes), flying squirrels, hot air balloons dropping torpedoes, keys that must be collected along the way, falling construction equipment, collapsing ceilings and zero checkpoints. But like most frustrating NES challenges, what seems near impossible at first quickly becomes muscle memory as you memorize how to avoid all the pitfalls through trial and error. Eventually you find your way to Dream 8: Nightmare Land. And let me tell you, this final area is aptly named. It is made up of three stages and although none are very long, they are merciless. You are now able to use Nemo’s scepter. In doing so, you can hold down the B button to charge a blast. You can only shoot the blast diagonally upward, however, and I’m not entirely convinced charging the blast is worth it… ever, really. The stages contain exploding bursts of flames which were programmed with a pretty wide hitbox, so you quickly learn to avoid even the area surrounding it, as any part of the animation cycle will cause you damage. What can only be described as falling mutant dandelions sway across the screen as they descend, following you with what seems like very sophisticated AI. Your best bet with these blackhearted destroyers of childhood happiness is to stand still and trick them into falling straight down. That’s usually the strategy with NES games – how do I deceive this programming into letting me proceed? Another area that required swimming was filled with alligators. At one point, I noticed one gator was glitching as he swam back and forth, on and off screen. I learned that by swimming my way to the other side of the screen slowly resulted in him glitching out and disappearing entirely. When Capcom throws an endless supply of enemies at you, you gotta deal with ’em anyway you can. Each part of Nightmare Land has a boss; part one pits you up against an evil penguin king, part two is run by a flying, fire-breathing stingray and part three is headed by the big man himself, the Nightmare King. Lose all your lives at any point during these three parts and it’s back to part one. 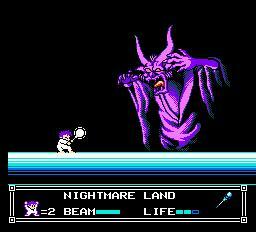 The Nightmare King bested me several times, but once I got in that NES gameplay groove, he was done for. That groove you hit when you know you’ve collected all the necessary information needed to defeat the boss and there are no other easy ways out; it has come down to nothing but full concentration and execution. Man, that feeling of zeroing in on the last hit or two before you win is pretty palpable, huh? Feels the same way it did when you were six. Nemo is a rad game. Tough at times, but fair, and a pretty diverse experience. Throw it onto the stack of Capcom classics – definitely worth your time.